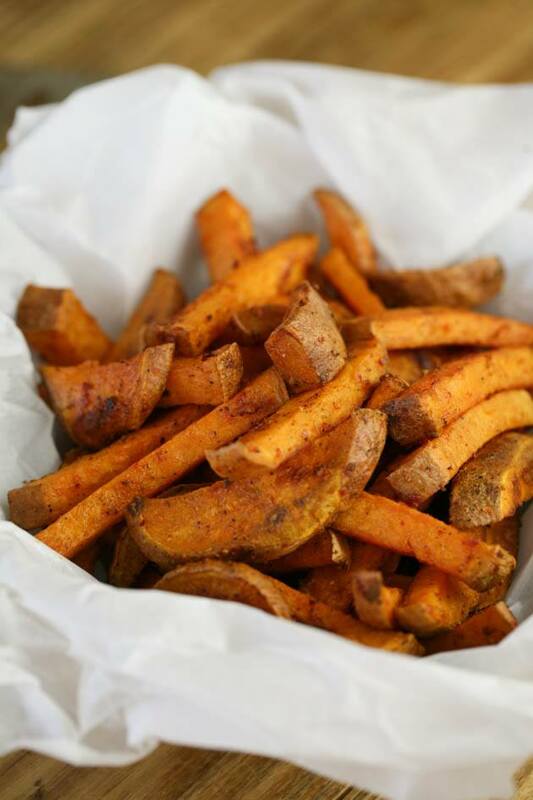 This is a simple recipe for amazing oven baked sweet potato fries. 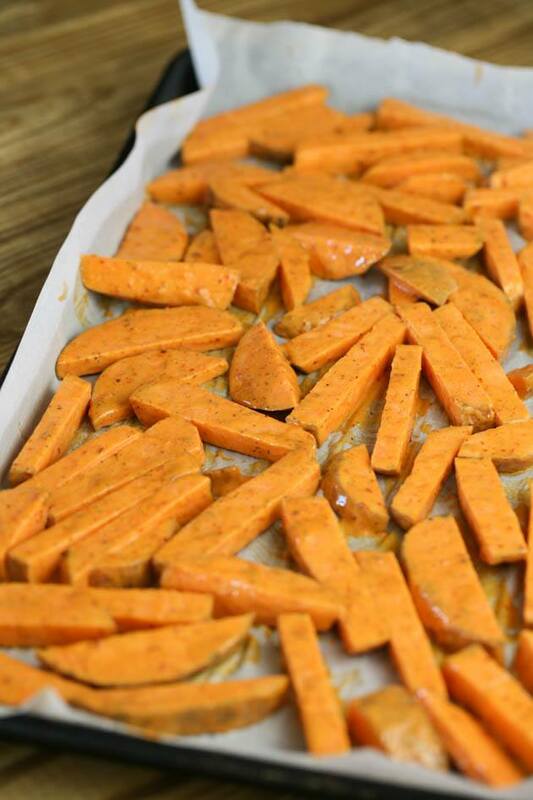 It’s a great side dish that everyone loves – kids and adults. 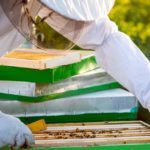 Very quick to put together and we’ll use common ingredients that you most likely already have on hand. 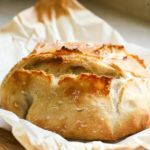 Baking time is just 30 minutes so this should be very simple to serve for either lunch or dinner. Printable recipe is at the end of the post. I love sweet potatoes! I grow my own sweet potatoes every year (you can learn how to grow sweet potatoes by reading How to Plant Sweet Potatoes, a Step-by-Step Guide), but considering the fact that I live in North Carolina – the Capital of the Sweet Potato, crates of sweet potatoes that aren’t from my own garden usually find their way to my front porch in the summer. We have so many sweet potato growers around here. It seems like often they are left with a lot of sweet potatoes and those find their way to the Christian centers in town. These centers just hand them out to whomever wants sweet potatoes. I am never up to date on local (or any other kind of…) news so I have no clue when those parties are happening, but I have the best neighbors a person can ask for and they just pick up some for me and the kids and bring them over. Sometimes I come home to find a crate of sweet potatoes or onions or something else on my front porch, it’s so helpful and so heartwarming! Even though I usually get free sweet potatoes during the season, I still grow sweet potatoes myself. I love the plant! I love the beautiful flowers, I love how it’s crawling everywhere, I love how strong it is — there are no pests to deal with! And, of course, we all (the kids and I) love the digging and finding of the potatoes. I’ve tried in the past to grow purple sweet potatoes (read: Growing Purple Sweet Potatoes) but I found that they weren’t as sweet as the orange ones, so now I stick with the regular orange potatoes. So you can imagine that between the ones I grow and the ones I get I end up with a ton of sweet potatoes in late summer, and I am not complaining! 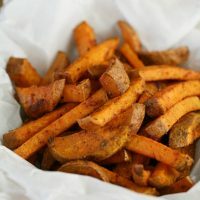 There are so many amazing dishes with sweet potatoes, one of my favorites is this simple oven baked sweet potato fries. 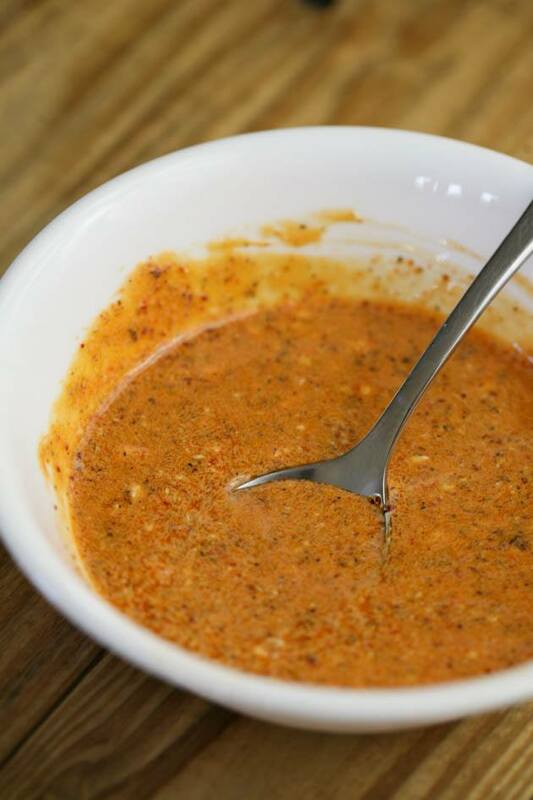 To a small bowl, add 4 tablespoons of olive oil, 2 tablespoons of mayo, 1 tablespoon ketchup (if you want a little spice you can add hot sauce instead of the ketchup or do half a tablespoon ketchup and half hot sauce), 1 teaspoon black pepper, 1 teaspoon paprika, and salt to taste. 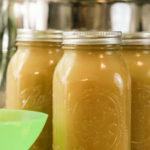 This is all we (my mama and I were cooking together) put there this time, but you can also add some garlic powder or even some cumin if you like, they are a great addition as well. Next (sorry that I am missing a couple of pictures here…), wash two large sweet potatoes well. Cut off the ends but do not peel the sweet potatoes. Then, cut the potatoes into 1/4 inch wide, long strips. The peel adds to the crunchiness of the fries. It’s very tasty and very healthy, so there is no reason to remove it. Just make sure you wash the potatoes well and dry them well before you start slicing them into fry strips. Put your potato slices into a large mixing bowl and add the sauce on top of them. Then give the fries a good mix to coat all of the strips with the sauce. 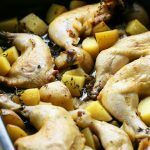 Preheat your oven to 400 F. Line a baking sheet with parchment paper and spread the potatoes in one layer on the baking sheet. Place in the preheated oven and bake for 20 minutes or so. I always check my fries after 20 minutes because my oven is a bit old and it seems to bake everything better from the bottom and not so much on top. If your oven is more even than mine, you can probably just leave the fries as they are on the baking sheet and give them a bit more time (like 10 more minutes or so). Since my oven is not a great one, I usually use a spatula to flip the fries then I place them in the oven for an additional 10 minutes. You can play a bit with the time. If you like them drier and crispier you can leave them in the oven for a few more minutes, if you like them a bit softer you can remove them from the oven. Let the fries cool for a couple minutes before you transfer them to a bowl. Spread with a bit more salt and enjoy while they are still hot! It’s a regular dish in this house! I know this whole eat-in-season thing is trendy and cool right now and it’s probably the right thing to do, but I am not going to pretend that I am good at it. 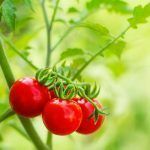 There is no way I can last months without this simple side dish, and can you imagine not eating a tomato for seven months? I faint just from the thought! So fresh vegetables from the grocery store it is for us during the winter and I am just fine with it. It’s summer somewhere and those farmers need support too. What I am trying to say is, eat oven-baked sweet potatoes. Always. No matter the season! 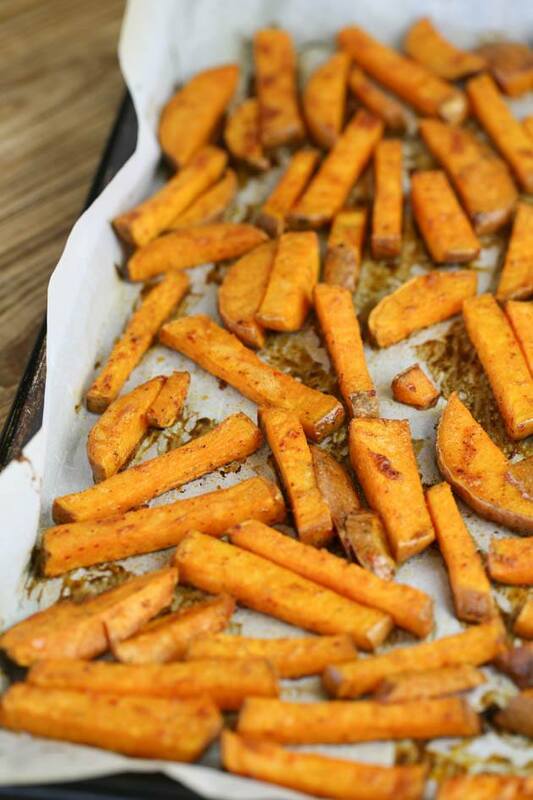 Simple to put together oven baked sweet potato fries that everyone is going to love! Wash and dry your potatoes well. Cut both ends of each potato and slice into 1/4 inch wide fry strips. 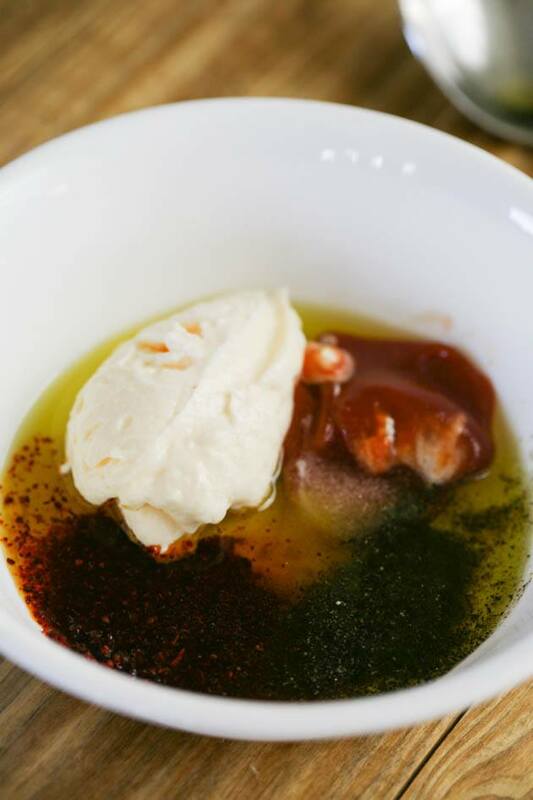 In a small bowl, mix together the olive oil, mayo, ketchup, black pepper, paprika, and salt. 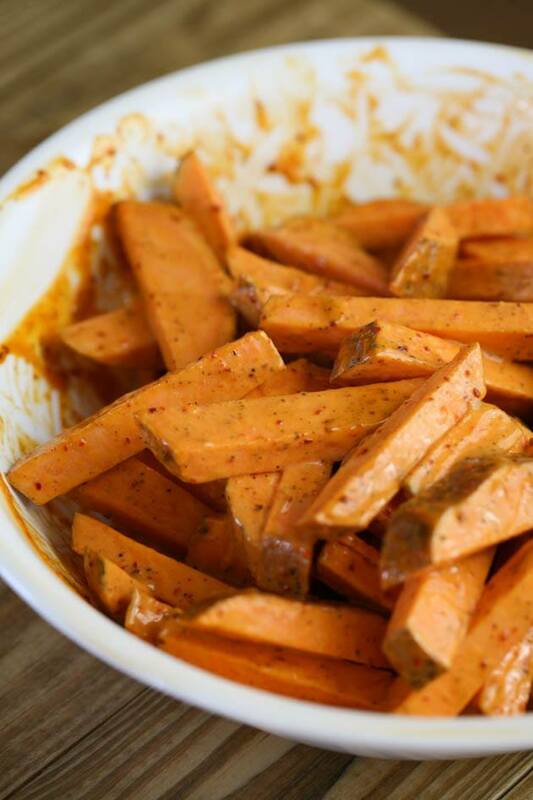 Put your sweet potato slices into a large mixing bowl and add the sauce on top. Mix it well until all of the potatoes are coated with the sauce. 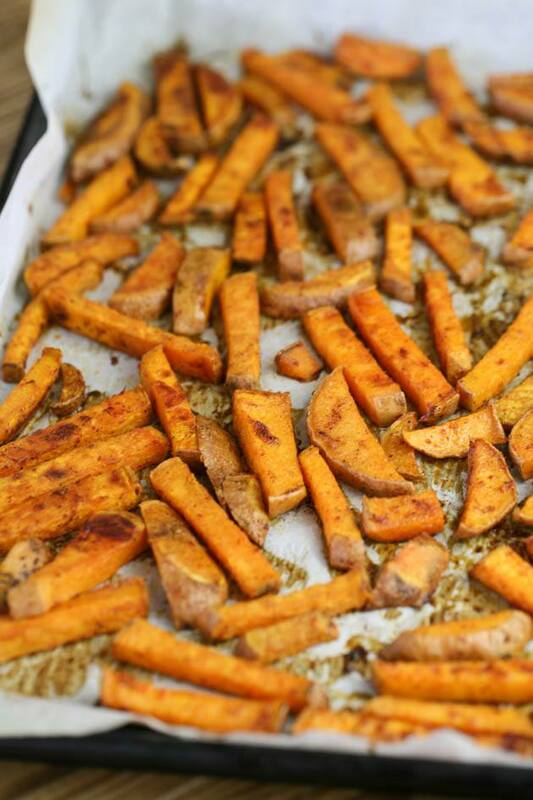 Line a baking sheet with parchment paper and set your fries on the baking sheet in one layer. Bake for 20 minutes, flip, and bake for another 10 minutes. Or a little more depending on how crispy you like your fries.